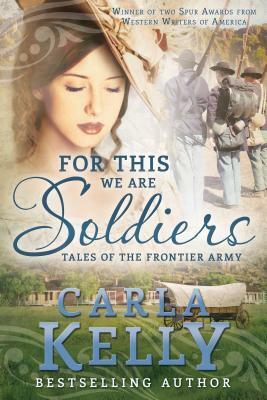 From master storyteller Carla Kelly comes this collection of frontier tales that take you behind typical army lines and into the hearts of ordinary men and women who perform extraordinary acts of bravery. From handsome hospital stewards and dashing soldiers to courageous children and wives who will pull at your heartstrings, there’s something for everyone’s fancy. Carla Kelly is a master at historical fiction. She has a way of adding details true to the era, personalities, language, and setting elements that transport the reader. For This We Are Soldiers includes short novellas from the Indian Wars, some previously published, and other short stories are brand new. It is a compilation that gives a sample of the hardships of war, the day in and day out interactions and romance between unlikely candidates. Ms. Kelly knows her Western history and these heroines have true grit. Content is clean, but best suited for adults as there is innuendo about marital relations. This reference could have been a left over from the previously published mass market romance version of the short story.